Rubin "Hurricane" Carter was riding a wave of success. The survivor of a difficult youth, he rose to become a top contender for the middleweight boxing crown. But his career crashed to a halt on May 26, 1967, when he and another man were found guilty of the murder of three white people and sentenced to three consecutive life terms. 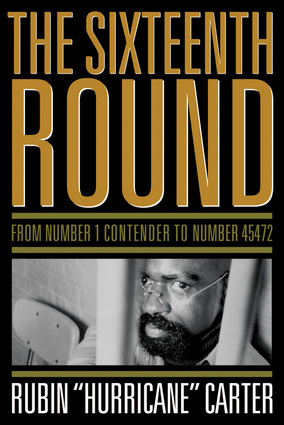 Written from prison and first published in 1974, The Sixteenth Round chronicles Hurricane's journey from the ring to solitary confinement. The book was his cry for help to the public, an attempt to set the record straight and force a new trial. Bob Dylan wrote his classic anthem "Hurricane" about his struggle, and Muhammad Ali and thousands of others took up his cause. The power of Carter's voice, as well as his ironic humor, makes this an eloquent, soul-stirring account of a remarkable life. Rubin "Hurricane" Carter was released from prison in 1988. Former chair and CEO of Canada's Association in Defence of the Wrongly Convicted and, since 2005, CEO of Innocence International, Dr. Carter is the author of Eye of the Hurricane: My Path from Darkness to Freedom. His life has been the subject of three books and a major motion picture, The Hurricane, starring Denzel Washington. The recipient of honorary doctor of law degrees from Griffith University, Australia, and York University, Toronto.